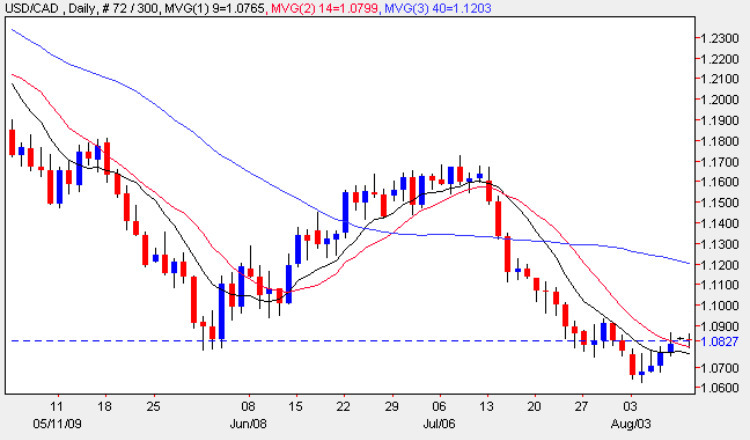 Friday’ candle on the usd to cad daily chart, made a brave attempt to struggle higher once again, and to try to continue the short term reversal which was signalled on Tuesday with the gravestone doji candle. With such deep resistance ahead, this seems unlikely to be anything other than a temporary breather for the market following the steep decline of the last few months. This would certainly seem to be the case on Friday, with the candle closing the session with a deep upper shadow which struggled to hold above the 14 day moving average, and finally closed below later in the trading session. However it is also interesting to note that the base of the candle found support from the 9 day moving average, so we may see a continuation of this move higher in the short term. For any sustained rally we will need to see a weekly close above the 1.12 price level, coupled with strong support from all three moving averages, and much will now depend on the fundamental news this week which is of course dominated in the US with the FOMC meeting. With no news for Canada ( or the US ) today, the main economic data this week will be the Canadian Housing Starts tomorrow, followed by the Trade Balance figures for both countries on Wednesday, with the FOMC release later in the evening, so a busy day. Until then we are likely to see little real price action for the usd to cad as the currency pair continue to try to grind higher in thin trading volumes.